Well, in case anyone hasn't figured it out, I am a nerd. I have collected stamps since I was young when my grandfather started me in it. It is amazing how much you can learn from stamps. Not the least of which is world geography. 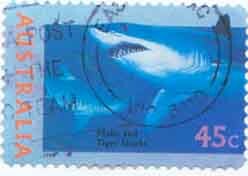 Of course, most countries put their most famous faces (leaders) on stamps, or, their most famous places, and often their most amazing animals. 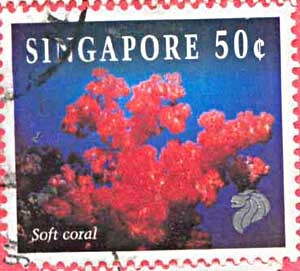 Many countries produce stamps specifically for the trading and collecting crowd. Many of these types are often of things not from their country. Things that will sell, from Disney stamps or movie stars, to animals from other countries, anything that might make collectors buy. Because if collectors buy them, the producer does not have to deliver any goods or services! I recently heard that some 10-20% of U.S. stamps are bought by collectors. That is, the Post Office does not have to deliver "the goods." It is ALL profit! You don't have to sort the mail, take it out in rain, sleet, snow or whatever, and deliver it somewhere! What a deal! Stamp collectors usually are either hard-core serious for the money types; or like me, layfolk for pure enjoyment. The latter group often collects "topicals," which is a certain subject (topic) matter ... such as space and aviation, or ships, or air mail stamps, or in my case, birds and fish. Surprised? 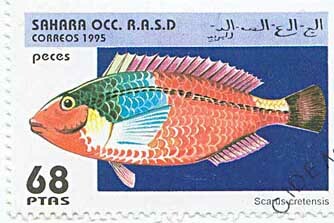 As a rule, fish stamps are not valuable collector's items. Most are very inexpensive, and there is no shortage of interesting species depicted from interesting places. You can seek out rare expensive ones though, if you want. 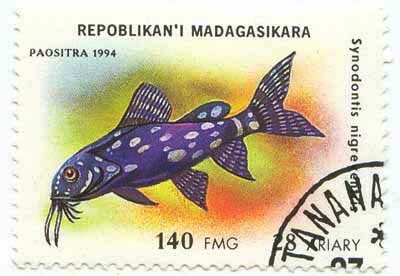 Surely, nearly a thousand species of the world's fish (5%) have been depicted on postage stamps. It would be interesting to have them all cataloged. There's a book I would buy! Note most of these scans are small, just to give you an idea of how they look. Some have been enlarged to show some more of the detail though. They all look better in person. We had to reduce the sizes so all the pictures wouldn't be such a humongous file. Sorry ! Amongst my favorites are scientifically correct and accurate sets of species found in the country of issue. Here is a set of ten rarer species of the genus Betta (but not the popular Betta splendens) from Cambodia. Spectacular! These are fish you will probably never see in person unless you're a "Bettaholic." Educating people about your natural history crown jewels is a great thing stamps can do. Consider the recent set of mini-sheets (Nature of America) the U.S. has been issuing with each natural habitat: prairies, Pacific-Northwest rain forest, the Everglades, and all of ours favorite, the Pacific Coral Reefs minisheet, which redeemed ourselves after that .29-cent issue (which you'll see later in this article). 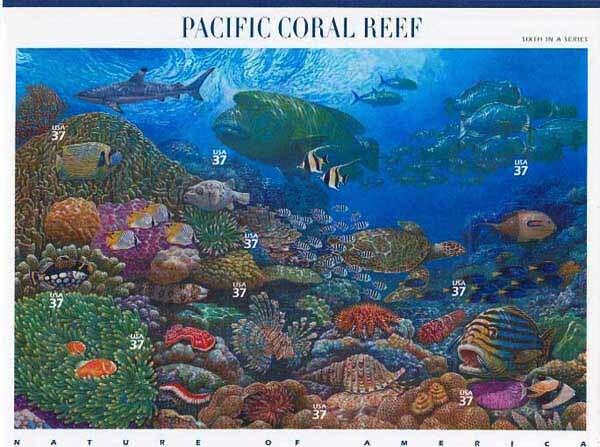 Each habitat mini-sheet shows a suite of wildlife from fish to birds to butterflies found in the habitat depicted. I imagine lots of people saw things they didn't know we had, and that is good! No one cares about saving that which they don't know. A personal favorite topical sub-category is "Bio-spoilers." These are stamps that have incorrect biological information on them, like the wrong bird calls always placed in the backgrounds in movies.... it drives me nuts. A couple of birds from California calling in Sicily in The Godfather messes it up for me. It happens in stamps too, though you would think they would have time to research and get it right. Somewhat odd are sets that have fresh and saltwater fish mixed, and unusual are those with fish not found in the country of issue. First the sought-after and beautiful "Rolls Royce" of African Synodontis "Upside-down Catfish," Synodontis angelicus, is mis-named with the binomial Syn. nigriventis!! The common brown one! 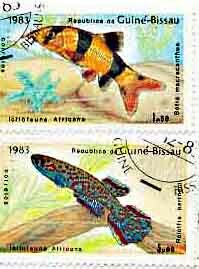 Then even worse this French Guinea issued set called Icthyofauna Afrikana (African fish) which contains a stamp with a Clown Loach - from Indonesia (SE Asia) only - on it! The killifish is great though! And one of the best bio-spoilers is amongst a rather cartoonish set, this Tanzania issue of a fish shaped like a Porkfish (they obviously used the same silhouette for shape - cookie cutter art), but painted exactly (correctly) as a Humuhumu Trigger, and since that wasn't a big enough flub, they call it "surgeon fish" (which most of us consider a tang) !!! A 3-way bio-spoiler on just one stamp! It may be a record folks. Most countries are pretty good about getting it right though. 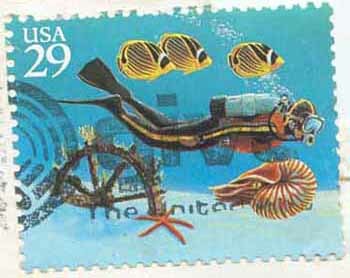 Australia put out a beautiful set of marine life stamps about a decade ago, which included Leafy Sea Dragon, Weedy Sea Dragon, Sea Apple, a Cone Snail, and all sorts of great stuff. 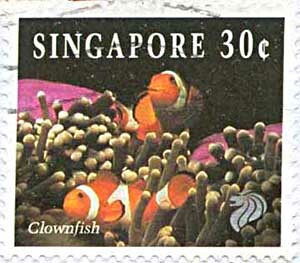 I never cease to be amazed at the marine life that show up on stamps. Some sets have stunning photographs with the new inexpensive printing technology available nowadays, which is nice. Often the painted artwork is outstanding and excellent too, better than some of the "art" I've seen in some aquarium books. Fish stamps can certainly make an interesting sideline hobby with fishkeeping. 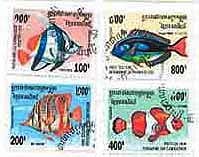 For the price of one good fish, you can get a hundred or maybe even hundreds of fish stamps. I have never had a single DOA, or even lost one yet either. Well, actually, I lost a few for a while, but I refound them. 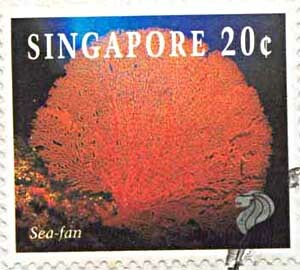 This is an interesting stamp from a country where we get corals, Timor. 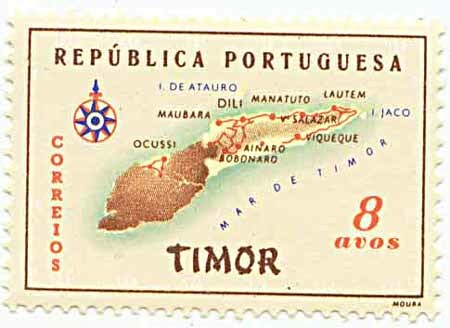 This 1956 issue is a map of the country (another common topical subject of collectors) from when it was a Portuguese territory. 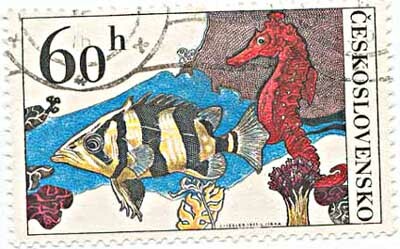 This Czechoslovakia issue shows a Sea Horse and a Datnoides with some corals. None of which is found there of course, but at least the people got to see that such things exist! Neat artwork. 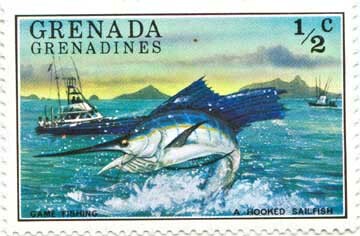 This Grenada issue commemorates the importance of the sport game fishing industry to them. Exquisite painting and a very beautiful stamp. 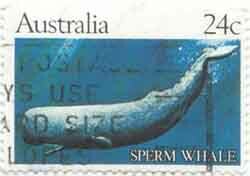 Here are a couple Australia issues, with some of their true beasts worth commemorating: Sharks and Sperm Whale. Nice, huh? 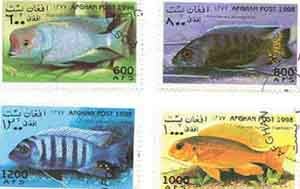 This is part of a set from Djibouti that has a nice Clown Sweetlips and Copperband Butterfly. 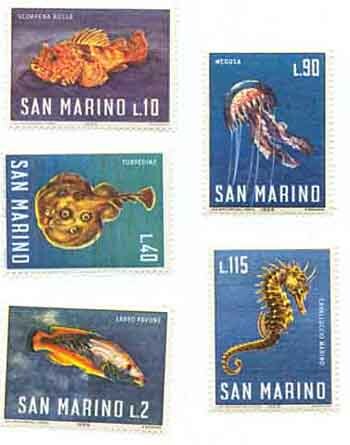 Here is part of a set from San Marino, a country in the Mediterranean region of Europe showing some. of the local marine life there. Perhaps some of you remember our .29 cent stamps? Here was one we issued with Racoon Butterflies, a Nautilus, and a diver on it a few years back. No diver sees nocturnal (when near surface - which is 200&apos;+ deep for them) deepwater Nautilus when they are swimming around with the butterflies right over the sand (note starfish)! I guess we were destined to produce our own bio-spoiler eventually. 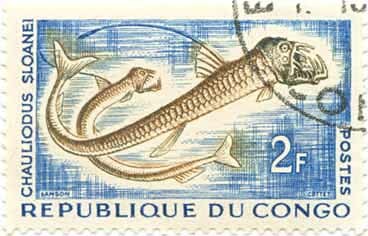 Here is an interesting issue from the Congo in Africa, landlocked as it is, but it didn&apos;t keep them from putting a deep sea Viper Fish on a stamp. I don't think they are reef safe fish. 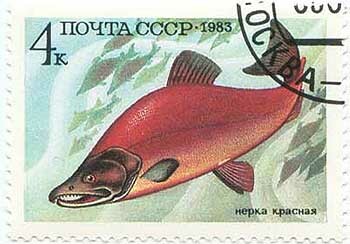 Here is a Sockeye Salmon from Russia, in which instead of the binomial, they give the Russian name for it. This is a common practice, useful if you read the language from the issuing country. I prefer binomials (scientific names). 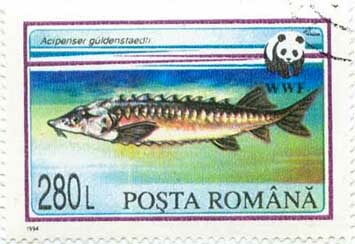 Here is a Sturgeon from a set depicting each type of Sturgeon, from Romania. 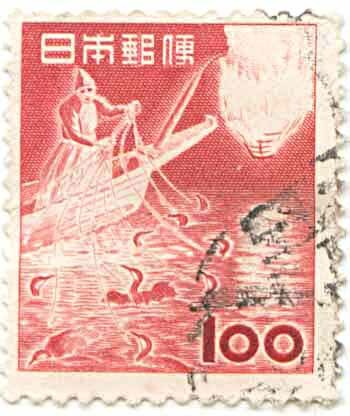 The source of caviar, commemorated on a stamp. Several species of Sturgeon are in trouble now. Here, the great conservation group World Wildlife Fund, helps sponsor a stamp, to educate the public about the problem, and to raise money for it. 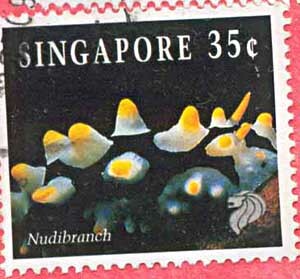 These Buriatia stamps like many animal stamps, have the binomial so identification is exact and indisputable. Often the binomial is the only thing on the stamp you can understand! 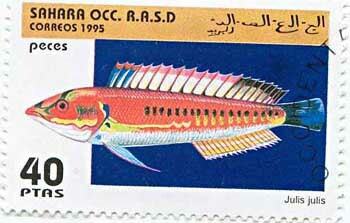 Here is a stamp with one of the neatest things you see on stamps, and that is the culture of the country of origin. Here is a man working, in Japan. Can you tell me what he is doing? You're wondering what this has to do with fish? A guy in a boat wearing sunglasses with some birds ?? Well he is practicing the ancient Japanese art of fishing with birds. One of the most incredible relationships between man, bird, and fish, ever in the world. The cormorants of course dive for fish to eat. Each bird has a leash or tether with a brass ring around the base of its neck. They light the big paper lantern torch (why they wear sunglasses) to attract a school of fish. Then they turn the birds loose on 'em! The neck ring is too tight for the bird to swallow the fish. They are pulled in when their necks are full, the fish stripped out of the neck, the ring is popped, the bird gets one, and is sent back down. Amazing huh!?!?! That is the magic of stamps at its best, showing how people live in other places. 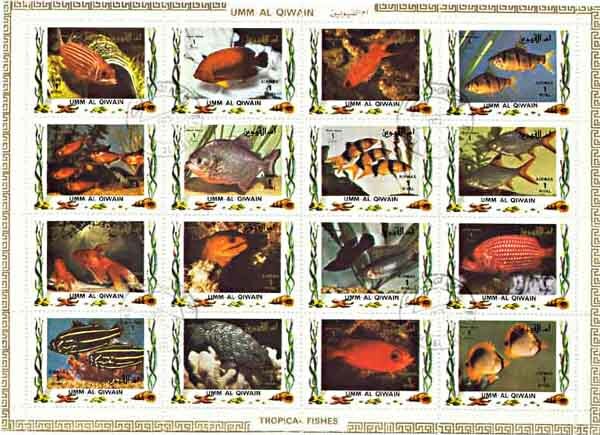 You may recognize some good ol&apos; Dr. Herbert R. Axelrod color photos from your old fish books in this Umm-Al-Quain set! 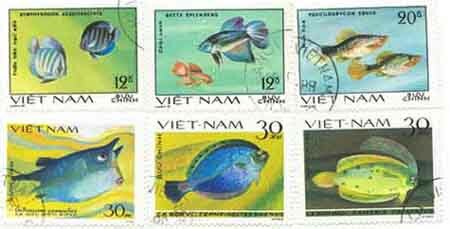 We hope you have enjoyed your virtual tour of fish stamps of the world! We don't sell them, but if you search "fish" + "stamps" you can find lots of these and others very available and quite inexpensive. Where Izzat Fish &apos;n&apos; Coral From? ?